Whether your customers are interacting with you through your website, a marketing flyer, or at a conference, your brand should consistently be represented, and it should seamlessly integrate into all of your marketing materials. If you are a start-up working from the ground up or an established business that is looking to modernize, we’ll work with you to deliver a memorable brand. We create simple, memorable, and original logos to reflect your company’s individual character and philosophy. 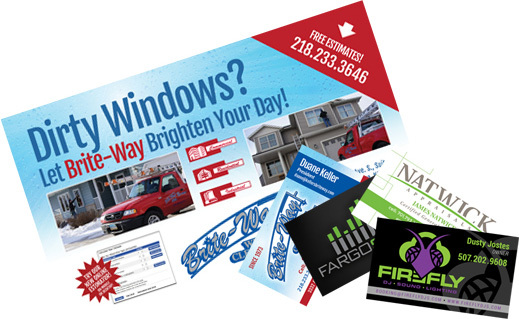 We offer print design services such as brochures, business cards, flyers, coupons, advertising layouts, postcards, newsletters, etc. to carry your newly created or existing brand across multiple platforms. We create beautiful websites, built on modern web standards, tested in modern browsers and on the most commonly used mobile devices. Our cloud-based web applications provide you with easy-to-use, feature-rich tools for job recruitment, property management, customer relationship management, etc. Ecliptic has worked with clients across a myriad of industries over the years. Read our case studies and see what he have accomplished.